The battle for Darayya in the Western Ghouta (collection of farms) of the Rif Dimashq province has recently intensified between the Syrian forces and the Ajnad Al-Sham and Liwaa Al-Shuhada Al-Islam terrorist groups. The Syrian Arab Army (SAA) and its allies continue a large-scale offensive inside the city. 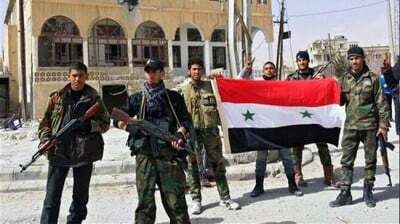 On Saturday afternoon, the SAA and the National Defense Forces (NDF) advanced the militants’ defenses inside the Al-Shayah District of Darayya and imposed full control over the Al-‘Arabiya Neighborhood which allows to control the road to Al-Mo’adhimiyah in rural west Damascus. According to the field reports, the SAA also destroyed the main Ajnad Al-Sham HQ building there. The Syrian forces restarted military operations at the Dara’a Al-Balad Quarter to reclaim the southern part of the provincial capital. Despite the pro-Syrian media statements about successes resulting in capturing several building blocks, the recent clashes have shown that the Syrian forces don’t have a momentum there. The fights are continuing. Separately, the SAA and the NDF carried out an assault at the eastern slopes of the Al-Hiyal Mountains (Jabal Al-Hiyal). 40 ISIS militants were killed. The SAA seized several ISIS points at the eastern slopes of the Al-Hiyal mountains and killed about 40 militants but it wasn’t enough to free this area. The pro-government forces have been continuing to advance east towards the city of Palmyra in the Homs province. Three separate bomb attacks killed at least nine people in and around the Iraqi capital, Baghdad. No group or individual has taken responsibility for these attacks. However, the ISIS militants are often considered to be the main suspect in such attacks. The Iraqi army conducted an operation against the terrorists in the area of Bu Hayat in the restive western province of Anbar on Saturday. The Iraqi forces destroyed a number of bridges constructed by the militants and killed five of them. Local reports also said that four members of ISIS were killed in an attack on the hideout of the militants in the city of Fallujah in Anbar Province on Saturday.